Today is Buttermilk Biscuit Day. American biscuits are nothing like British Biscuits which are cookies. No, our biscuits are more like scones, only fluffier. Buttermilk Biscuits are great with breakfast and gravy and chicken or just about anytime. I love biscuits. Following is a recipe for Chocolate Buttermilk Biscuits (see below). 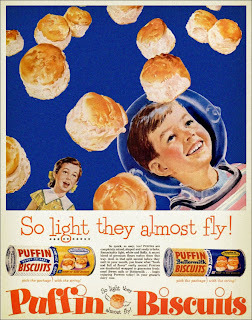 First, though, a few biscuit making tips from the Bisquick site. These apply if you use Bisquick or if you make your biscuits from scratch. 1. Leave an inch or two space around the biscuits on the cookie sheet. They'll heat more evenly and cook better. 2. In a pinch, a straight-sided plastic glass can also substitute for a rolling pin. 3. For crunchy top, skip kneading and rolling and drop biscuit-sized spoonfuls directly onto baking sheet. 4. Loosen freshly baked biscuits from tray with spatula so they don't stick. 5. Count to ten; kneading biscuit dough too much can make biscuits tough. 6. If you don't have a biscuit cutter, either use a knife to cut squares or cut rounds with upside-down drinking glass. A little flour or extra Bisquick on the knife or glass will help keep things from sticking. This recipe is great served with whipped cream and strawberries! Or just grind some Trader Joe's Chocolate Coffee Bean Sugar --or some Cinnamon Sugar-- over them just after you brush with the melted butter. Yum! Another variation: add chocolate chips to the dough. In food processor: Combine flour, baking powder, baking soda, sugar, cocoa powder, and salt. Pulse. Add cubed butter. Pulse until butter combines to create grainy mixture. Put contents of food processor in bowl. Make well in center and pour in chilled buttermilk. Mix to form sticky dough. Place dough on well floured surface. Fold dough a few time. DO NOT OVERWORK. Roll out dough with floured rolling pin to one inch thickness. Using biscuit cutter, cut out biscuits in straight up and down motion. Do not twist when cutting out the biscuits. Hint: Twisting will seal sides of biscuits preventing biscuits from rising and consequently make for tough, flat biscuits. Put cut out biscuits on parchment paper lined baking sheet so that they are close but not touching. Once all of biscuits are on baking sheet, bake for 10-12 minutes in center of oven until golden brown. Brush with melted butter. Tuesday Tips: Retro Cake Baking Tips! RED, WHITE & BLUE STAR BROWNIES: Memorial Day! S'MORES ICE CREAM CAKE for Memorial Day! Cocoa Spiced Salmon for Mother's Day! CHOCOLATE CREPES SUZETTE: Crepes Suzette Day! MINT JULEP TRUFFLES for the Kentucky Derby!